The 76-year-old was sentenced to 20 years in his third trial for the killing of his then-mistress. Her body has never been found. A FORMER RIVIERA lawyer was convicted today of killing a glamorous casino heiress 36 years ago, after a legal battle that has gripped France. Maurice Agnelet, 76, was sentenced to 20 years in prison in his third trial for the killing of his then mistress, Agnes Le Roux. She disappeared in October 1977, aged 29. Her body has never been found. Agnelet showed no emotion as the verdict was read in the court in the northwestern town of Rennes. Agnelet was initially acquitted of the murder but convicted on appeal in 2007 to serve 20 years — a verdict that was later overturned by the European Court of Human Rights. 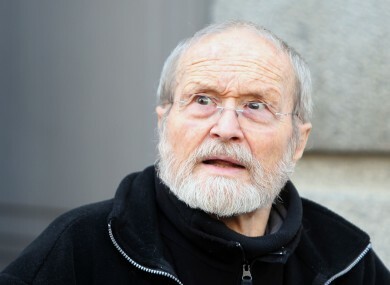 His retrial in Rennes has seen a number of shocking new revelations, including testimony from Agnelet’s own son who said he believes his father committed the crime. Guillaume Agnelet, 45, told the court on Monday that his mother had confided to him that his father had killed Le Roux in her sleep during a camping trip in Italy and then dumped the body by the side of the road. He said his father had also confessed in the 1980s to knowing the location of the corpse. Italian police launched their own probe after the accusation. Agnelet’s ex-wife and the mother of Guillaume, Annie Litas, rejected the accusations during her own tearful testimony, accusing her son of suffering from psychological problems. Before the end of the trial on Friday, Agnelet apologised to Le Roux’s family for his “attitude” since her death. He said he was sorry for any hurt “I may have caused the family with my attitude and my statements since Agnes’s unbelievable and tragic disappearance”. In a three-hour closing statement on Thursday, prosecutor Philippe Petitprez said there was no other explanation for Le Roux’s disappearance than her killing by Agnelet. In his closing statement, defence lawyer Francois Saint-Pierre had urged the jury to acquit, saying there was no concrete proof of Agnelet’s involvement. Agnelet has always denied murdering Le Roux, the heiress to the Palais de la Mediterranee casino in Nice. She disappeared months after becoming embroiled in a hostile takeover bid of her mother’s casino. Agnelet had seduced Le Roux and persuaded her to vote against her mother at a board meeting in June 1977 and to allow the casino to be sold to a rival owner. Money from the transaction — three million francs, worth the equivalent of about €1.7 million in today’s money — first went into a joint account in the couple’s name and later ended up solely in Agnelet’s hands. Agnelet was initially the prime suspect in the case but produced an alibi when another mistress claimed he was with her in Switzerland at the time. The woman, Francoise Lausseure, later admitted she had lied and the case was reopened. Email “French lawyer convicted of murdering missing heiress after 36 years”. Feedback on “French lawyer convicted of murdering missing heiress after 36 years”.